In Asheville, families can celebrate local culture with music and dance, embrace farm heritage, and enjoy an abundance of recreational opportunities. Check out these five outdoor activities sure to please kids and adults alike during a visit to this North Carolina mountain town. 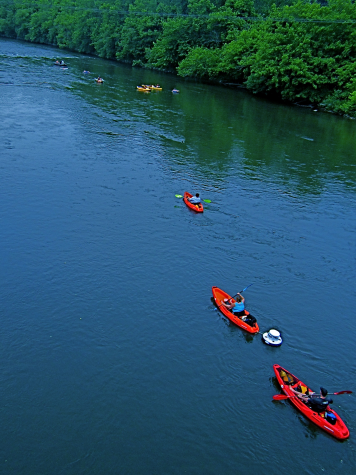 Floating along the gentle French Broad River is a great way to keep cool in the summer heat. If traveling with a large group and, therefore, have two cars, it’s best to “set a shuttle” so you can do a point-to-point float. Drop one car off downstream and then drive upstream to where you’ll enter the water. While there are many entry points, a sure family pleaser is the Bywater. If traveling with just one car, you can have Asheville Outdoor Center take care of the logistics instead. Rent kayaks, canoes, paddleboards and inner-tubes from Rental Me This. Expect the float to take about two to three hours, so pack plenty of snacks, water and sunscreen. By paying the required $5 to become a member of this private club, you can take advantage of its riverfront setting, which includes ample picnic and grilling facilities, and outdoor games. Adults can choose from 14 local brews on tap at the small on-site bar. The best way to really appreciate the lush canopy of trees that covers the rolling mountains of Asheville is by soaring through them. You can do just that at Navitat Zip Line Company, ranked one of the ten best zip line courses in America by USA Today. The course includes 10 zip lines and two suspended bridges. Navitat is just 20 minutes from downtown Asheville, but it feels completely secluded. The best time of year to go is in the fall when the leaves turn to shades of yellow, orange and red. Any time of the year, you will be treated to breathtaking views of the Blue Ridge Parkway and the Great Craggy Mountains. Asheville’s climate is ideal for farming, and the residents take pride in eating locally grown foods. All around town there are community gardens, farmer’s markets and “farm to table” signs at restaurants. One of the best ways to experience the farm culture is to pick your own fruits or vegetables. Most u-pick farms offer other attractions such as short hikes, tractor pulls, petting farms, and baked goods. Depending on the season, there are many to choice from. See a list of Asheville u-pick farms and then call to make sure they have produce available to pick during your visit. Listen to free bluegrass music at Pack Square Park in downtown Asheville on select Saturday nights throughout summer. Bring a blanket (or hotel towels) and sit near the front where kids (and parents!) dance. Performers go on for just two numbers each, and then they retreat to the sidelines where you are welcome to join their jam session. Shindig on the Green starts “along about sundown” or at 7 pm. No trip to Asheville would be complete without venturing along the Blue Ridge Parkway, named “America’s Favorite Drive” for good reason. Driving on the parkway offers plenty of spots to pull off the road to marvel at the vistas. 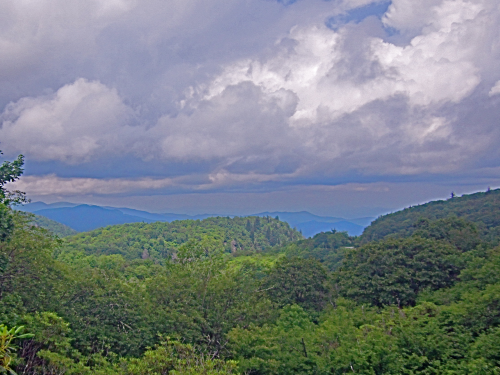 Two of my favorite hikes are about 40-minute drive south of downtown Asheville. Graveyard Falls is at milepost 418.8 and offers stunning views of waterfalls, big boulders to climb on, and places to go wading. There is a 2.3-mile hike to one of the falls that is a good workout for the whole family. Less than five miles further down the parkway at milepost 422.4 is Devil’s Post, a steep half-mile hike. While this hike is a strenuous uphill climb, those who make the effort are rewarded with panoramic views of surrounding mountains. After working up an appetite hiking, make sure to stop at Mount Pisgah on the return drive, located at milepost 408. With tables, grills and restrooms, this makes the perfect picnic stop. If you don’t want to bother with packing a picnic, Pisgah Inn Lodge Restaurant offers lunch and dinner. After your family experiences the gorgeous scenery, the mountain music, the fresh food and the outdoor fun Asheville has to offer, you may never want to leave! Ky Delaney quit her corporate job to look for an adventure and found the biggest adventure of all. From giving birth on her living room floor to breastfeeding at her favorite kayak run, Ky and her baby have many adventures in their sweet Southern mountain town. She blogs about all of their discoveries at SuddenlySouthernBlog.com. What would your family like best about Asheville? Let us know in the comments below! Asheville is such a fun town – very trendy, but also historic. 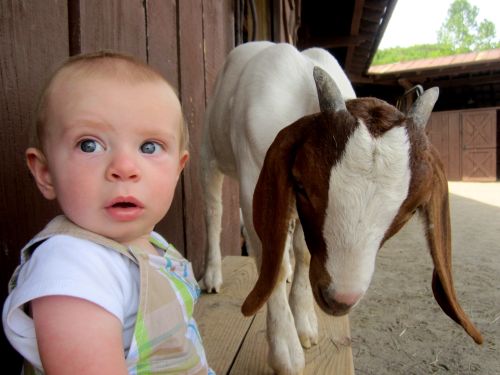 Here’s our family’s experience: http://metropolitanmama.net/2011/05/travel-with-kids-asheville/. Ky, did you happen to eat at The Laughing Seed Cafe? The food there is top-notch. Super flavorful (and healthy too!). Stephanie – Agreed! I loved Asheville when I visited to attend the Type-A Mom Conference a few years ago. The gorgeous trees, the hip but walkable downtown, the friendly people…such a lovely place to visit! Stephanie – I love The Laughing Seed. I live here in Asheville and eat there for lunch meetings all the time. It’s a real treat to eat delicious, healthy food. I’m glad to hear you enjoyed visiting Asheville as much as I enjoy living here! Colleen, Make no question about it – Asheville IS a great place to visit. But it’s even a better place to live! Thank you for sharing this wonderful article. Whether you’re into extreme sports or soft adventure, the mountains surrounding Asheville offer endless adventures. Traffic was no problem and the locations are well marked. We love the scenery and winding roads through the mountains. Awesome! My favorite sections is north of Asheville up to Mt Mitchell.